My friend Suzie, a seriously talented baker, popped in the other day and we were chatting about baking (as you do). I was completely blown away (and honoured) when she mentioned that she had tried a few recipes from my new low carb / sugar-free baking book. I was so, so happy to hear she enjoyed having a collection of healthier recipes that she knew were going to work. Instead of having to experiment on her own. If you’ve ever tried removing sugar, you know, it’s tricky because sugar doesn’t just provide sweetness. It also provides bulk and binds up moisture. It got me thinking about the mistakes I’ve made on this low carb journey so I thought I’d share some today so you don’t have to learn the hard way like I did! 1. Trying to Adapt Without a Proven Recipe. This book was easily the toughest I’ve ever written. Even though I’ve studied food science and worked in baking product development, it was a challenge to find the elusive balance between deliciousness and keeping the carbs and sugar low. While some recipes came together relatively easily (like the cake below where zucchini is used to take the place of sugar), others took many many attempts to perfect. And there were many that didn’t make it into the book, like the Double Chocolate Cookies based on black beans and cocoa powder. If my chocolate-loving 3-year-old wouldn’t eat them (and he didn’t) I couldn’t include them. Only recipes I was 100% happy with made the cut. As a minimalist, I like keeping my pantry streamline. Baking is one area it can easily get complicated, especially when sugar and flour are off the list. So I challenged myself to avoid any obscure ingredients and stick to the basics. With the exception of pure stevia powder (which I buy online), all the ingredients I use in the book are available in my supermarket. Of all three mistakes, this was the one I most suffered from. In the past I believed that in order for sweet treats to taste any good you needed to use real sugar. But having Gestational Diabetes gave me an incentive to try sugar-free baking again, otherwise I was looking at a very long 9 months without cookies or cake. I’d be lying if I said it was easy to make things taste amazing AND meet my health standards. But I kept being pleasantly surprised which gave me the courage to keep experimenting and ultimately write the Sunday Baking Sessions. ‘Nothing is impossible. The word itself says I’m Possible!’. 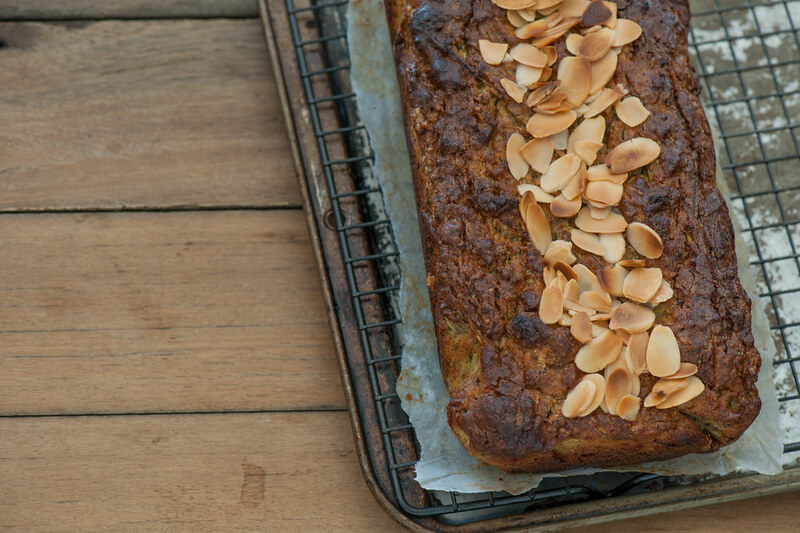 Like to try my ‘tried and tested’ collection of healthy baked goods and treats? 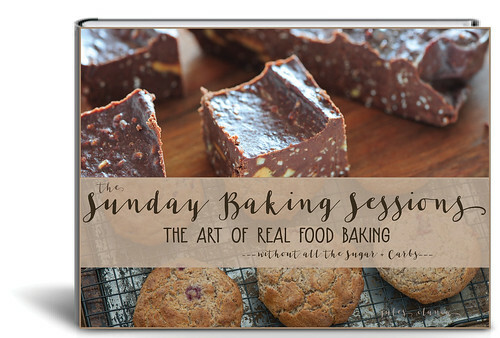 Then check out my new book, the ‘Sunday Baking Sessions‘. See also: 16 Tasty Ideas for Zucchini. From the ‘Sunday Baking Sessions‘. What!? Honey in a sugar-free baking book!? Believe me, I know honey is pretty much just sugar and I treat it as such. 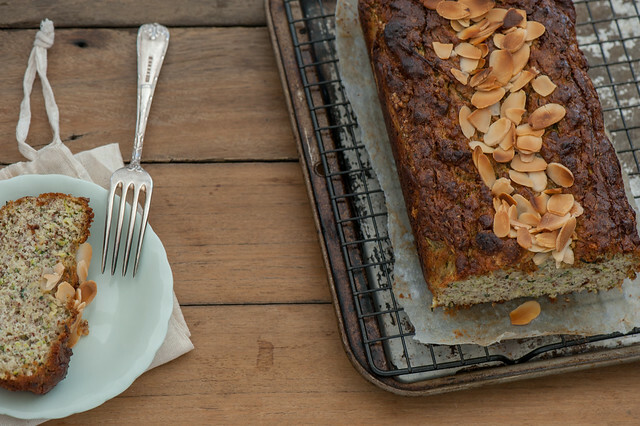 I spent a long time tossing up whether to included this recipe in the book and decided to leave it in because a zucchini and almond cake doesn’t sound as good. AND I’ve included a honey-free variation so that if you do want to keep your cake completely sugar-free you can. Plus it’s only 2 tablespoons in the whole cake. 1. Preheat your oven to 180C (350F). Line a loaf pan 24cm x 12cm (approx 9in x 5in) with baking paper. 2. Grate your zucchini (I use my food processor). Mix zucchini, almond meal, stevia, baking powder, honey, eggs, oil and vanilla (if using) in a medium bowl or just add it to the food processor. Mix with a spoon to combine but don’t stress if you end up with a few lumps. 3. Scoop the mixture into the prepared tin. Bake for 45-55 minutes or until the cake is deeply golden brown and feels springy. And a skewer inserted in the middle comes out clean. The honey will cause it to brown more than you’d normally expect. 4. Cool in the tin before serving. honey / sugar-free – replace honey with an extra teaspoon vanilla extract to make 2 teaspoons total. 1. Pure Stevia Powder – looks like icing (powdered / confectioners) sugar. It’s expensive but a tiny amount goes a long long way. We’re talking 1/8 teaspoon to sweeten a whole cake. This is what I use. 2. Granular Stevia (like Natvia or Truvia) – looks like regular white sugar. It’s a blend of erythritol and stevia. Usually 1/4 teaspoon = 4-6 tablespoons granular stevia. 3. Fresh or Dried Stevia Leaves – from a real stevia plant! I haven’t baked with them but they will behave similar to the pure stevia powder. Just add to taste. 4. Liquid stevia. I haven’t used this. But add to taste. granular stevia – replace pure powder with 4-6 tablespoons granular stevia. no stevia – use you favourite sweetener… Honey, maple syrup, xylitol or white sugar! Just add and taste until you’re happy with the sweetness level. sugar lovers – use 75g (3oz) sugar instead of the stevia. If you like things on the sweeter side double the sugar. nut-free / budget – replace almond meal with plain (all purpose) flour. Reduce baking time to 25-30 minutes. Or replace almond meal with finely ground sunflower seeds (I use a little coffee grinder) – no need to change the baking time. different veg – zucchini is my favourite because it’s low carb and mild in flavour. But feel free to experiment with carrot, parsnip, sweet potato or butternut squash. muffins – divide mixture between 8-10 lined holes in a 1/2 cup muffin tray. Bake for 20-25 minutes. round cake – use a 20cm (8in) round cake tin. Baking time should be closer to 40 minutes. extra pretty – sprinkle with a handful of whole or sliced almonds before baking like I have in the picture. Can be kept for 1-2 weeks in an airtight container in the fridge. Keeps for months in the freezer. I like to slice before freezing and defrost slices in the toaster (really delicious with lashings of butter or ricotta) but it can make a mess of your toaster! ps. Not sure the Sunday Baking Sessions is for you? Ben, Sunday Baking Sessions Owner. Ros, Sunday Baking Sessions Owner. Kathryn, Sunday Baking Sessions Owner. So glad you’re enjoying Jessi! Thanks for letting me know Beth! And so sorry for the error in the book.